An early contender for Dad of the Year effortlessly caught a foul ball while with one hand while holding his young daughter in the other at a Philadelphia Phillies game on Thursday night. The Phillies were playing the Toronto Blue Jays when the Jays’ Kevin Pillar hit a ball that went zooming into the seats. Our Hero Dad, Brian Kucharik, already had his hands full with his daughter Emily, a beer, and some french fries. Fortunately, he also had ninja-like reflexes. 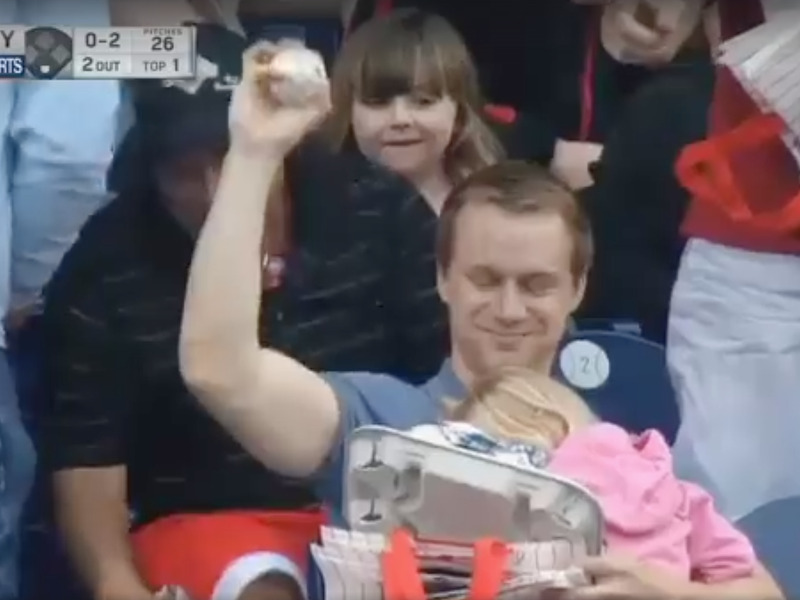 Hero Dad stuck out his hand almost casually, without moving much or disturbing his daughter as the ball zoomed straight to his outstretched bare palm. It was a magnificent catch. Kucharik did spill his fries, but the Phillies rewarded his amazing catch with a new basket, according to the MLB. The home team was pretty impressed with his fielding skills, even if the Blue Jays ended up winning the game 13 to 2. Dads. Is there anything they can’t do?